'Fear of flying' is defined as a specific phobia of the situational type, as in the tension I feel every time a recipe has a pie crust. I have tried to make a pie crust my whole life that didn’t have the texture of shoe leather. At long last, thanks to Erin Scott’s great instructions in the yummy supper cookbook, I have finally succeeded. 1. For the directions on how to make the pie crust, see yummy supper's post at this link, but use the quantities in the Ingredient list above. For a large galette, put the ball in plastic and flatten it to a thick round with your hand; for smaller galettes, divide the dough into four balls, wrap, and flatten. Put the dough in the refrigerator for 1 hour or up to 2 days. 1. Dust a piece of parchment paper with flour, and roll out the chilled dough under a piece of plastic wrap. Put the rolled out dough back in the refrigerator while preparing the filling. 2. Peel, core and slice the apples. Toss the slices with the juice. 3. Take out the pie crusts. Trim if desired. Arrange the apples in a circular pattern, leaving about 1-1/2" - 2" clear at the edge. 4. Fold up the crust and brush it with egg yolk. Slowly pour the melted butter into each galette. 5. 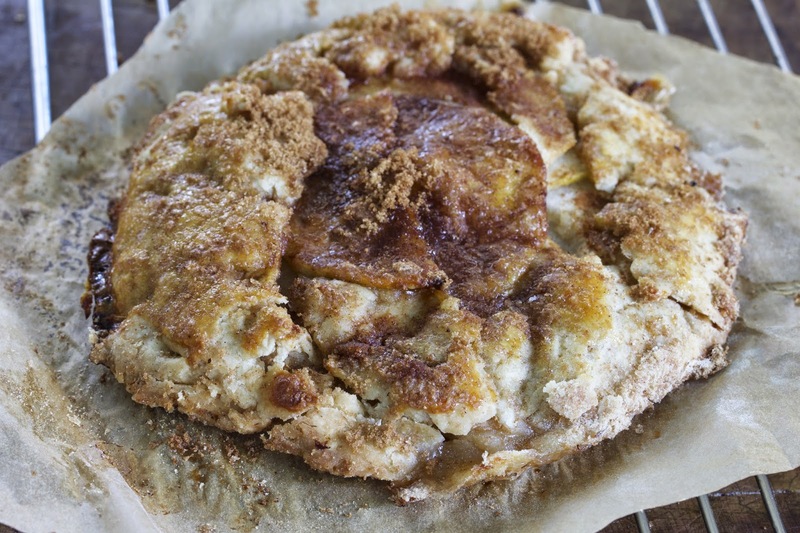 Put the sugar and cinnamon in a bowl, mix and sprinkle over the top of the galettes. 6. Bake the galettes on a parchment lined baking sheet for 35 minutes, or until the crust is browned. Makes 4 small or 1 large galette.